Monday-Friday 7:00 a.m.-4:00 p.m. 120 North Pasadena Blvd. Monday-Saturday 10:00 a.m.-3:00 p.m. Preston at Pasadena Blvd. Please call the Sanitation Department at 713.475.7884 to make an appointment for pick up. Empty plastic paint cans will NOT be accepted. Pour 1/2 full cans of paint together to make cans full; no longer accepting numerous 1/2 full cans of paint. Paint with dried paint layers no longer accepted. Make sure the containers are not leaking. DO NOT combine hazardous materials into a plastic bag. This will almost always cause a leak or spill. Leaking or spilled materials will NOT be accepted at the Recycling Center. DO NOT LEAVE ANYTHING AT THE RECYCLE CENTER AFTER BUSINESS HOURS. VIOLATORS WILL BE FINED. 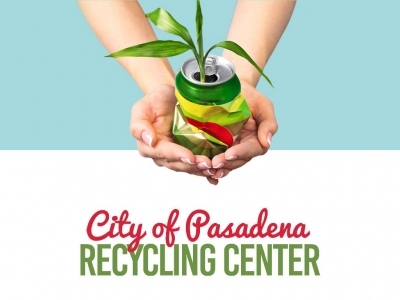 The city encourages all its citizens to recycle through two programs. In a partnership with Waste Management, the City has established the recycling drop-off point above, or curbside recycling (city limits).